Matched betting is not complicated at all. Instead, it is very simple and it is just a two step process which involves you placing a bet using your own money and then using a free bet or bonus offered by the bookmaker to guarantee a profit. See, I told you it was simple, read my matched betting explained guide ! What can make people think it is complicated is the maths behind it and those who are trying to do it alone to save them money by not using a matched betting service. Remember risk always comes from not knowing what you are doing and I would happily pay Oddsmonkey £15 a month or £150 a year to know that I am doing everything correctly and safely to make my profits from matched betting. The £15 aside the earnings potential is so small that it’s not even peanuts! I will now explain fully what matched betting is, how it works, how the maths works and more importantly how matched betting makes you money. So grab a coffee and pay attention, I will explain this in as much detail as possible to ensure anybody can understand this. Matched betting involves two steps; a qualifying step and the free bet step. A qualifying bet is the first step in matched betting and you must follow a set of terms in order to receive a free bet from the bookmaker. During the qualifying bet process, it is common for us to make a few pennies loss so don’t be alarmed. We never expect to make a profit from our qualifying bets as this would be arbitrage. The above image is a great example of a matched betting signup offer so we will use this as an example throughout this article. Ladbrokes are offering us a £50 free bet but first we must sign up with them and use a promotional code called “F50”. It is critical we use this code as if we forget to enter it; Ladbrokes could end up not crediting our free bet. First we must deposit £50 with Ladbrokes and place a back bet at odds of 1.5 (1/2 fractional odds) in order to qualify for a free bet with them. Any less than 1.5 and Ladbrokes will not credit our free bet as we have not met their terms. Next, we need to decide what selection we are going to bet on. Using a matched betting service like Oddsmonkey will make this process easier for us and take a lot less time. Their Oddsmatcher tool will search for the best possible match for us to bet on at odds of 1.50. So we will have a look now. We have found a great match. So we will be betting on Porto to be winning the game against Monaco at half time. What is good about this match is the odds are relatively short and they are very close to each other and it is not an arb so we shouldn’t cause any immediate suspicion to the bookies upon placing this bet. So we now need to use the matched betting calculator to work out our lay stake on Smarkets. Here we have the matched betting calculator with numbers I have listed to help you understand what information needs to be entered. I will now explain the six steps. Ensure that when placing the qualifying bet, the calculator is set to “Normal”. This is because the bet we are placing is using our own money and a free bet will be credited whether the bet wins or loses. The back stake is the amount of money we will be betting with the bookies. In this example, we need to bet £50 with Ladbrokes so we have entered £50 in this box. The back odds are the odds at the bookmaker we are betting at. In this example, we are betting at odds of 1.87 for Porto to win at half time so we enter 1.87 into this box. The lay odds are the odds at the exchange we are going to be laying at. In this example, the lay odds are 1.87 at Smarkets so we enter 1.87 into this box. The lay commission is usually a percentage and represents the amount of commission the exchange charges on winning bets. As we are using Smarkets, this is 2% commission so we just enter a number 2 into this box. After we have followed the first 5 steps, this calculator then does its magic and works out your lay stake and potential liability required. If you are happy with the amount of liability needed in the exchange, then you can proceed and place your back bet with Ladbrokes and lay bet at Smarkets. You can ignore the “Back commission” box as we are not placing our back bets at an exchange, only ever at the bookmakers. So now we need to place our back bet at Ladbrokes on Porto to win at half time with our £50.00. This is what the bet slip will look like on Ladbrokes. So if the bet wins, we will have £93.48 in our account. The back odds are actually 1.8696 (£93.48/£50.00) which is almost 1.87 so we will still use 1.87 here. Once you are happy with this and you have selected the correct selection, go ahead and click “Place bet”. It is recommended that you always place your bookmaker back bet first before the lay bet in case the exchange odds change at the last minute. It would be a lot more difficult to recalculate everything if you lay your bet first and then place your back bet if the bookmaker odds change. We now need to lay Porto to win at half time and you can see the lay odds are exactly 1.87 which is great. From the matched betting calculator, we need to use a lay stake of £50.54 so we enter this underneath the “back stake” box on Smarkets as you can see above. This will give us a liability of £43.96 so we just need to deposit this into Smarkets and then place our lay bet. Once we have done this, we have done the qualifying stage and you can move on to the free bet stage. I will explain the maths involved so that you can know the calculator works. The lay side is on the right side too so it is the dark blue numbers we are mainly focusing on, not the green numbers on the left side as they are to place a back bet. We will have £93.48 in our Ladbrokes account. This is taken from the screenshot above. We will lose our exchange lay bet, so we will lose £43.96 from Smarkets. So if the bookmaker bet wins in this example we will lose £0.48. This is approximately what the calculator tells us which is fine. We will retain 98% of our lay stake from Smarkets. This is because Smarkets charge 2% commission on winning bets which leaves us with 98%. So, 98% of £50.54 is £49.53 (to 2 decimal places). As the bookmaker bet lost, we will lose our £50 bet at Ladbrokes. To work out our qualifying bet loss, we need to deduct your back stake from our lay winnings. So, £49.53 – £50.00 = -£0.47. So if the exchange bet wins, we will lose £0.47. This is exactly what the calculator tells us which is great. Now that we have successfully completed the qualifying step, we will receive a free bet from the bookmaker. In this example, Ladbrokes will credit us a £50 free bet now. To extract the most amount of profit from this free bet, we will need to place the free bet at high odds of at least 5.0. So we use the Oddsmatcher at Oddsmonkey to find us a good match to bet on. The Oddsmatcher has found us a great match which we will use again in this example. The horse is called Freddies Portrait in the 15:00 at Haydock race. The odds are 10.0 and the lay odds are also 10.0 which is great because the numbers are big enough and they are very close. So now we are happy with the match from the Oddsmatcher we will now need to enter this information into the matched betting calculator to work out our lay stake on Smarkets. So we have now entered the information into the matched betting calculator, we now need to use this information to place our bets. I have listed numbers 1-6 so you can follow the below easily. Because we are now using a free bet where the stake is not returned, we must put the matched betting calculator into free bet SNR mode. The back stake is the free bet stake offered by the bookmaker. In this example, this is £50 from Ladbrokes. The back odds are the odds which we need to place our free bet at the bookies. In this example, Freddies portrait is available to back at odds of 10.0 on Ladbrokes. The lay odds are the lay odds available to lay on Smarkets. In this example, we can lay Freddies portrait at 10.0. The lay commission is the commission charged on winning bets at the exchange. This is 2% again because we are using Smarkets to lay our bets off. Once we have entered all the information above, the calculator will then work out what we can expect to make from this match. In this example, we will earn £44.19 if the bet wins or loses so we will go ahead with this example as it is more than 80% of the free bet of £50.00. First, we need to place our free bet at Ladbrokes. I have already done this offer so the free bet won’t show but if you are placing your first bet with Ladbrokes, the free bet will show. This is the bet slip at Ladbrokes. I have highlighted a small region in red as this is where the free bet will usually show up. The potential returns would actually be £450.00 not £500.00 because the stake is not returned. So once you are happy you are using the free bet go ahead and click “Place bet”. Once we have done this, we can then place our lay bet at Smarkets. So from the matched betting calculator, it says we must use a lay stake of £45.09 at lay odds of 10.0 on Smarkets. Our liability for this bet will be £405.81 so we will need to ensure that we have this in our Smarkets account. Once you are happy with the numbers and you’re confident everything is correct go ahead and place the lay bet. Again, the lay odds are in dark blue on the right side so always stick to those numbers. I will now explain the maths behind the free bet stage and this will show you how you make money from matched betting. Exciting stuff ahead so stay tuned! We will have £450.00 in our Ladbrokes account. This is because the back stake is £50.00 and the back odds are 10.0 which gives us £500.00. But we then deduct the £50 back stake as this isn’t returned to us. So we are left with £450.00. Our exchange lay bet has lost so we have lost our liability from Smarkets. This means we have lost £405.81 from our account. To calculate our profit, we deduct our winnings at the bookmaker from our exchange losses. So £450.00 – £405.81 = £44.19. So if the bookmaker bet wins, we will earn £44.19, which is what the calculator tells us. We will retain 98% of our lay stake. This is because Smarkets charges 2% on winning bets so we keep the other 98% of the winnings. So 98% of £45.09 is £44.19 (to two decimal places). Because the bookmaker bet lost, we don’t lose anything because the free bet wasn’t our own money. So we have made £44.19. We also keep the liability in Smarkets because the exchange lay bet has not lost, it has won. So if the exchange bet wins, we will still earn £44.19 which is what the calculator tells us. We then need to deduct our qualifying loss from this profit figure. Our qualifying loss from the first step is £0.48 and the profit we made from the free bet is £44.19. So £44.19 – £0.48 = £43.71. So from this example, we would have made £43.71 and this is how easy it is to make money from the free bets in matched betting. I have done this as extensively as I can over text and images so hopefully you have followed every step carefully. To make £43.71 from a free bet of £50 is a great result as you’d normally expect to make £40.00 so we have taken excellent value. I hope this matched betting explained guide has been of help to you all. This is a brief insight to how you can make money matched betting. The ways you can make money from matched betting isn’t just limited to this example. There are ways to make money without free bets, accumulators, each way betting, dutching, extra places and of course using free bets like this example. Matched betting simply puts the numbers in your favour so that you can make a profit every time you place a bet. Another great thing about matched betting is that it doesn’t take long. Think about how much time people spend at work to earn £43.71 after tax, a day, 5 hours, 4 hours? This example can be achieved within an hour for beginners and even less time if you have some matched betting experience already. 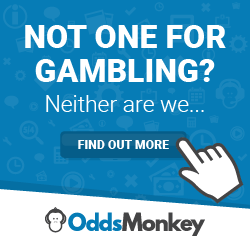 Using a great service like Oddsmonkey is also recommended as you can follow expert tutorials and matched betting software to make the most of your matched betting earnings. They also have a free trial where you can make £45.00 for trying it out. You can also make an extra £10.00 from Smarkets from your free trial by signing up here.